Discover Budapest, the enchanting city of vibrant contrasts while staying at the Budapest Marriott Hotel. 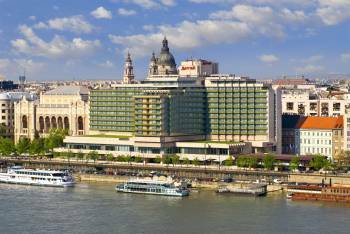 Located in the city center, on the bank of the Danube, just minutes away from attractions like the Parliament or the Buda Castle, the Budapest Marriott Hotel brings the city to your door. Uniquely in Budapest all guestrooms of the hotelhave spectacular Danube view, a view that is part of the World Heritage. All rooms were refurbished in 2018 therefore sparkle with fresh look, luxurious Revive® bedding, inviting design, and comfortable smartly shaped work areas. Unwind with a cocktail or espresso in our contemporary AQVA Lounge Bar before dining at our stylish Peppers! Mediterranean Grill, where you will find a mix of artfully prepared Hungarian-Mediterranean flavours. Such a central location makes this Budapest hotel perfect for meetings, conventions, social events and weddings in the city. With the renowned Marriott service, creative catering and a variety of conference rooms, the Budapest Marriott Hotel is the best choice.